It’s pretty loud and clear by now that the boundaries we used in the past to define urban music have been knocked down. There are no constraints with music, style or look. Collaborations happen with the most unlikely of pairs. Based on appearances many R&B artists might be tossed in the indie/alternative category. We can either nostalgically pine for the days of boy bands in matching all-white suits and hip hop that centred around actual real issues, or we can embrace the urban music revolution. This open-minded approach also applies to the revamp of blue-eyed soul, of which Robin Thicke could be a front runner. He has recently released his fifth studio album Love After War and after first glance Thicke has a bit of an edgy, flirty Robbie Williams vibe and comparisons with 90s legend Jon B are unavoidable. His impressive falsetto prompts Justin Timberlake comparisons, and his smooth crooner style and James Dean-esque hairdo have associated him with Michael Buble. However, Thicke isn’t so easily put in a box. The American recording artist started his musical career like many other successful singer/songwriters – writing for established artists such as Brandy, Christina Aguilera and Mya. These days Thicke writes songs that he records himself. Love After War comprises a whopping 17 tracks, all of which he wrote and at least partially produced himself. In fact, his credits on the album include art direction, bass, composer, drums, executive producer, piano, producer and vocals; homeboy has talent. The opening tracks, An Angel on Each Arm and I’m an Animal, are both surprisingly funkier and more vocally forceful than Thicke’s past offerings. From then on however the record slows down to Thicke’s more characteristic style of soft, smooth vocals and feathery ballads. 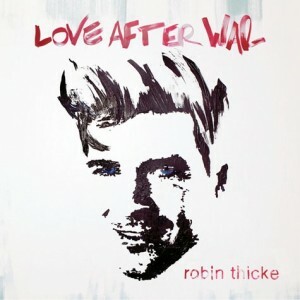 The lead single is the title track Love After War and the video features Thicke’s stunning wife, actress Paula Patton. Although Thicke is well-known for his collaborations, the only guest vocal on this album is Lil Wayne on Pretty Lil Heart. Love After War has a soul/funk, almost vintage feel and Thicke’s seductive tones croon in fluffy sounding songs about love and freedom, maintaining a strong masculinity. The track listing is a little inflated and listeners might start to grow tired, however it is evident that Thicke has been maturing and changing remarkably over his five studio album career. Unafraid to break out of his niche, he is experimenting and evolving as an artist and adding to his ever-growing resume.